Social anxiety can be annoying and frustrating, but believe it or not, it can sometimes come in handy as well. 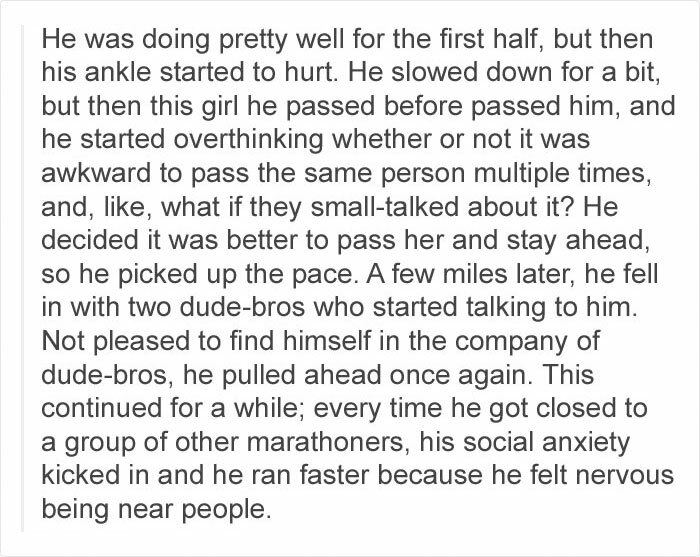 A Tumblr user named Riley, who studies mathematics at the University of Texas, recently blogged about a friend who ran a local marathon and finished in record time. It seemed an unlikely story at first, given that the guy was an introverted, awkward mathematician, but his avoidance of “making small-talk with randos” – or rather, making an effort to avoid socializing with other runners – turned out to be his source of strength in the end. We don’t know who this brave soul is, but he’s made a pretty good case against anyone who claims that introverts can’t be productive. Read the entire hilarious story below, and let us know if your lack of social skills has worked towards your advantage before!